Horse owners are a rare breed. We have provided a lot of barns and stables in the Perth area and we have learned 2 important things about horse owners: they love their horses and they know exactly what they want. Consequently, most horse owners pass up standard barns and stables in the Perth area for a customised version. 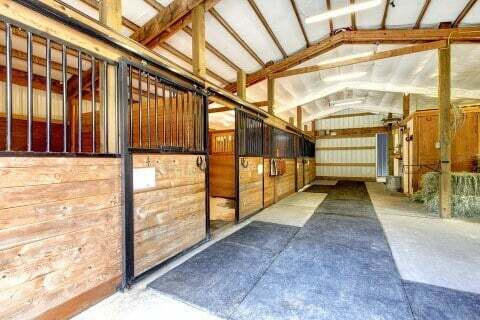 There are many factors to take into consideration when designing a custom horse barn. We have learned through experience that it is far more efficient to plan now than it is to make adjustments later. Here are some things to consider when getting ready to design custom barns and stables for your Perth area farm. Where do you plan to put your barn? You can control the environment by the barn’s orientation to the sun and the wind. Ideally, you can let the summer breezes in and keep the winter wind out. You can also use overhangs to provide shade in the summer and it is always great to have your barn near some trees. You will need a site that has good drainage to keep your stable healthy. Too much moisture will attract insects and some vermin which can spread diseases. The appearance of your barn or stable will project your image to all of your Perth area neighbours. What does your barn tell visitors and neighbours about you? Do you want brass fittings and a high-end finish to project prosperity or do you want to project a strictly business approach? Your materials, architectural style and interior fittings can say whatever you want them to say about you. Horses are wonderful animals but they are fragile and can be hurt in many ways. It is wise to eliminate fire hazards, sharp edges and any potential for disease or contamination. Failure to provide adequate ventilation can result in your horse developing respiratory problems due to dust, bacteria, fungus and odours that cause air to become unhealthy. Since hot air rises, it makes good sense to have a heavy-duty vent at the top which allows hot air to escape and draws fresh air into the barn. The optimum roof pitch is 45 degrees, which means the roof rises one unit for every 2 units of length. This forces hot air to the peak of the roof. We recommend a ridge vent for air to escape out the roof. It is very economical and therefore very popular. It goes down the entire peak of the roof and remains continuously open. A Clerestory vent is larger and has louvres that keep birds and weather out while allowing air to escape. Cupolas are also efficient, allowing sunlight into the barn while moving hot air out—they look great, too. Every stall should be equipped with a door that opens out. Dutch doors are common, as are grill doors and mesh doors. Many recommend doors that provide a full view because of superior ventilation characteristics and increased sunlight. Natural lighting is important for raising horses and ventilation options that also increase natural light should always be the preferred options. Flooring is also important. The most popular product now is popcorn asphalt, which is hand-tamped and laid hot. The finished surface has voids that allow liquids to drain easily. Busy stalls can have a trench drain at one end and rubber mats can also be utilised. Rubber bricks make great flooring for veterinary and wash areas. They are non-slip, durable and can be easily sanitised. There are plenty of combustible materials in the average barn. Electrical wiring, paint and equipment are flammable. Hay is flammable, for that matter. If you use wood products, make sure they have been treated with a flame retardant and that your wiring is up to code. Also, don’t store bulk hay in the barn, especially in the loft; storing hay in your loft can hinder ventilation. We recommend the biggest barn possible while taking budget and available land into consideration. It needs to be big enough for the maximum amount of horses you will have during the life of the barn. Horses are strong, so they need strong walls and roof. Your stables will be safer and more secure that way. We have amassed an unparalleled track record of customer satisfaction providing barns and stables in the Perth area. Our barns and sheds all carry the ShedSafe logo and our 3-D Colour Designer allows for easy colour customisation. Join our legion of satisfied Perth customers. Call 1300 778 628 today.